Holiness is an essential attribute of God, who is called more than 30 times in the Bible “Kadosh Yisrael,” “the Holy One of Israel.” From the biblical perspective, whatever or whoever comes into contact with God is, or can be, holy: the people Israel, sacred times, physical objects related to the divine service (e.g., sacrificial animals or Temple incense), and particular places. Contemporary Judaism emphasizes holy time. As Shai Held writes, Abraham Joshua Heschel’s masterful The Sabbath has played a crucial role in giving priority to sacred time over sacred place. But the concept of holy space is central to Judaism. Holy space is space that is strongly associated with God. It is first mentioned in Exodus 3:5, where Moses is told at the burning bush, which manifests the divine presence, “Remove your sandals from your feet, for the place on which you stand is holy ground.” The Jerusalem Temple and its predecessor, the Tabernacle (Mishkan), are both called Mikdash, a name derived from the word for holy or sanctified (places). Both the site of the burning bush and the Tabernacle dedicated in the wilderness were holy spaces outside the Land of Israel. But holiness is especially associated with the Temple in Jerusalem, where some manifestation of God was imagined to reside. This holiness is sometimes extended beyond the Temple precinct; thus the prophet Joel speaks of God “dwell[ing] in Zion, my holy mount. And [all of] Jerusalem shall be holy” (4:17). Elsewhere, this holiness encompasses the entire Land of Israel (Zechariah 2:16). It is unclear if this holiness emanates outward from the Temple — connected to some aspect of God’s residence at the Jerusalem Temple — or if it is more closely associated with the idea of God’s special care for the land (Numbers 35:34). For most of the Bible, therefore, it was crucial to worship God in the Land of Israel. In Psalms we read, “How can we sing a song of the LORD on alien soil?” (137:4). This same idea is reflected in two relatively unknown biblical stories. In Joshua 22, the two-and-a-half tribes who settle east of the Jordan River — in other words, outside of the recognized boundaries of Israel — build an altar there. They are severely castigated by leaders living in Israel proper and are told: “What is this treachery that you have committed this day against the God of Israel, turning away from the LORD, building yourselves an altar, and rebelling this day against the LORD? (22:16) … If it is because the land of your holding is unclean, cross over into the land of the LORD’s own holding, where the Tabernacle of the LORD abides, and acquire holdings among us…” (22:19). Similarly, when David flees from Saul and is concerned that he might be forced to leave Israel, he complains that leaving Israel will force him to worship other gods (1 Samuel 26:19). But for (almost) every biblical tradition, we find a counter-tradition. The prophet Ezekiel was exiled to Babylonia in 597 B.C.E., 11 years before the destruction of the First Temple in 586. Like the author of Psalm 137, he had to imagine whether the divine presence in any form followed the people into exile. In 11:16, he reaches a remarkable compromise — that God is with Israel but as a mikdash me’at, a mini-temple or mini-sanctification. (This usage is often misunderstood to suggest that the synagogue, a mini-Temple, originated during this exile.) If Psalm 137 insists that God cannot be worshiped in foreign, impure Babylonia, Ezekiel states just the opposite. We now follow the example of Ezekiel: We pray as Jews outside the Land of Israel. But holiness has been further transformed. Whether in Israel or in the Diaspora, the synagogue ark, where the Torah scrolls are stored, is called in Hebrew aron hakodesh, “the holy ark” — using the same root k.d.sh, “to be holy,” used in earlier texts to describe the Temple, Jerusalem, and Israel. Afghani Jews call it heichal hakodesh, “the holy temple,” employing the word heichal, which is often used for the Jerusalem Temple in the Bible. The Torah scrolls, through which God is now manifest, convey holiness to the ark, allowing us to experience holiness both in and outside of Israel. This builds upon Ezekiel’s innovation that holiness is not confined to the Land of Israel. Instead of finding holiness in a place or in time, we endow holiness to a sacred object standing at the center of each Jewish community. This story "Reconciling Holy Space & Time" was written by Marc Zvi Brettler. 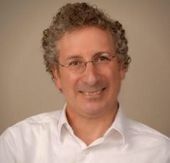 Marc Zvi Brettler , a biblical scholar, is the Bernice and Morton Lerner Professor in Judaic Studies in the Center for Jewish Studies at Duke University. He is currently working on a commentary on the Book of Psalms while enjoying a sabbatical in Jerusalem.